It can sometimes feel like a challenge to find a strong, durable flooring option that also looks good and comes at a reasonable price. If you’ve got a specific design in mind, but need a floor that holds up to heavy use, then consider stopping by Flooring America for luxury vinyl flooring in Oklahoma City, OK. This resilient flooring option doesn’t just fit your budget, but also fits the look and feel of any room you are looking to upgrade. Flooring America is your source for the finest in luxury vinyl tile and plank flooring available. This type of flooring perfectly mimics the appearance of many other--often more costly--flooring types, while also maintaining its beautiful appearance for many years. Before you spend the money on hardwood or natural stone flooring, take a minute to discuss our LVT options, and find out why more and more homeowners are choosing it for their properties. From the moment you first walk into our flooring showroom, you are going to find yourself quickly impressed by the comprehensive selection of luxury vinyl plank flooring we have available for you to choose from. Available in a wide variety of colors and styles, this flooring option allows you to add the right amount of classic appeal to any room in your home. This state-of-the-art flooring option doesn’t just look good though, as it is also strong enough to prevent moisture damage, warping, and the other issues that can come with more delicate types of flooring. Whether you enjoy the appearance of natural stone or hardwood, you can find the same magnificent designs and styles for a much more reasonable price when you purchase luxury vinyl instead. Choosing vinyl is not a compromise on your part, as this flooring type blends high-end design elements with a more utilitarian approach to flooring. After all, what good is flooring if you can’t use it? Vinyl flooring has benefited greatly from the improvements made in flooring technology throughout the years. Once regulated to kitchens and classrooms, vinyl has become one of the most coveted flooring options on the market for homeowners and even business owners. Why? It is because today’s luxury vinyl flooring is just as good in looks as it is in function. 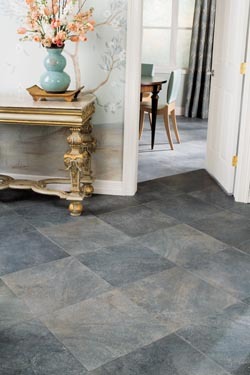 Contact us for more information about our current selection of luxury vinyl tile. We look forward to providing sales, service, and installations to customers located throughout the Oklahoma City, Oklahoma, area, including Midwest City, Moore, Yukon, and Edmond.